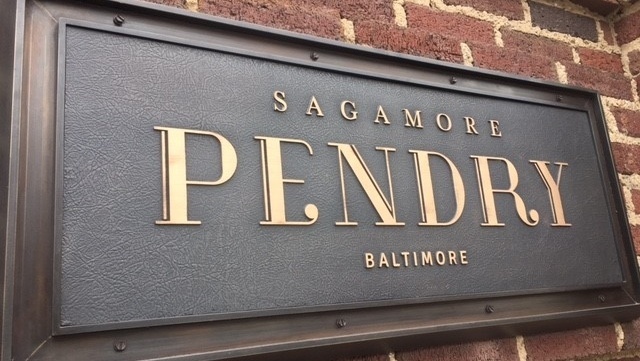 TAUNTON, Massachusetts—August 31, 2017—Royal Contract Lighting announced today that it has created dozens of lighting fixtures to enhance the public spaces of the Sagamore Pendry Baltimore hotel, the second hotel to open under the banner of Montage International‘s new luxury hospitality brand, Pendry. 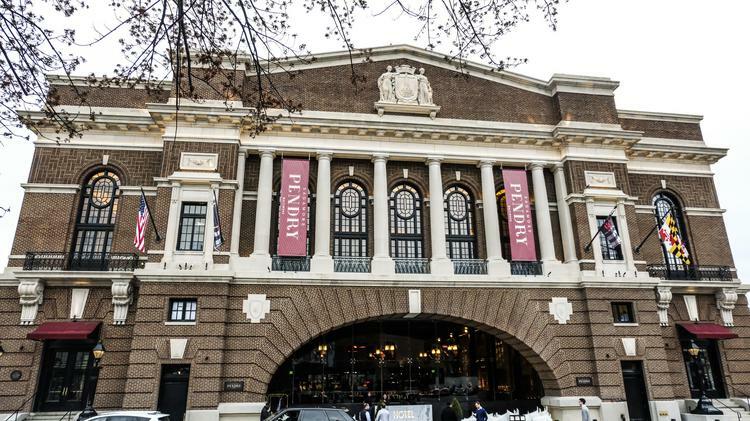 Developed by Montage International in collaboration with the Sagamore Development Company (owned by Kevin Plank, founder, chairman, and CEO of Under Armour), the 128-room property perches on the historic Recreation Pier in the city’s Fell’s Point neighborhood. A large-scale project such as the Sagamore Pendry Hotel plays to Royal Contract Lighting’s strengths: manufacturing facilities in the United States and China enable the company to source the highest-quality raw materials at the best price, shorten manufacturing time, and provide superior service. 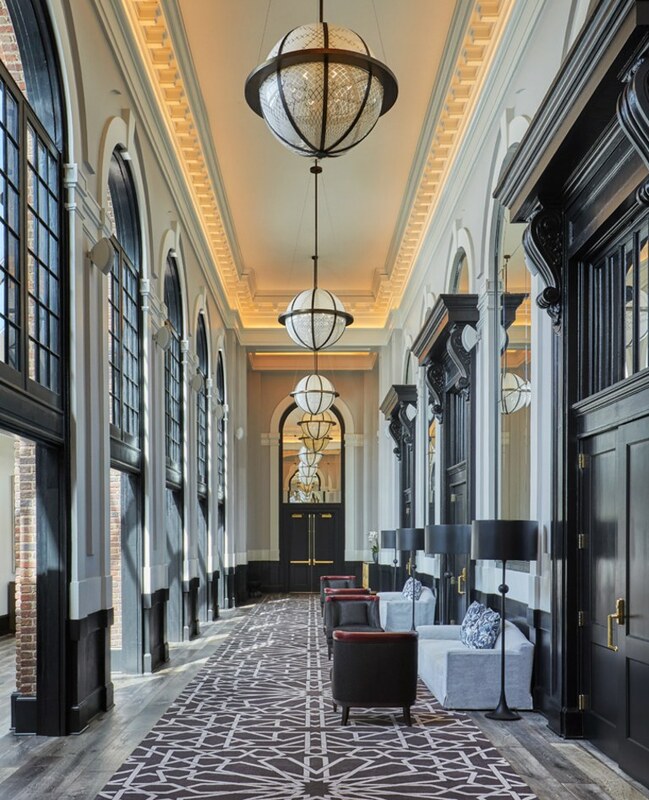 These capabilities meant that the dozens of fixtures required by the historic hotel renovation could be produced to exacting budgetary and scheduling requirements. 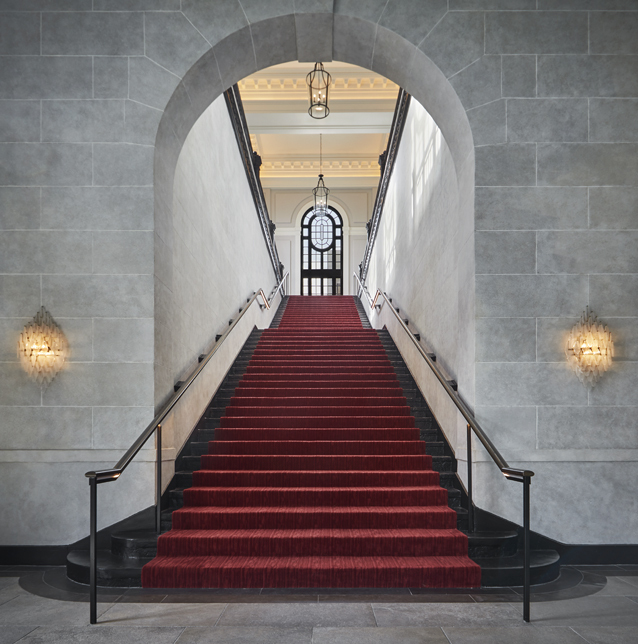 Royal Contract Lighting was commissioned by the Stroud Group to create 55 custom fixtures to light and beautify the hotel’s public spaces, including two intricate seeded-glass sconces for the entrance to the restored two-story grand staircase. To complement the elegant plaster moldings and gold leaf accents of the Grand Ballroom, Royal Contract Lighting created five 42” white alabaster chandeliers in an antique bronze finish. 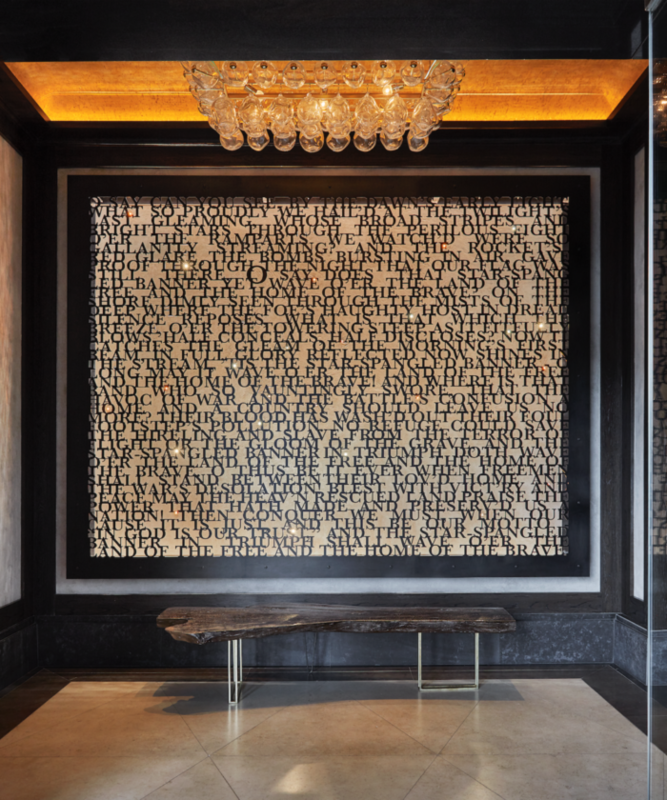 The hotel’s Entry Vestibule is illuminated with a custom 54” fixture adorned with 76 dimpled glass shades. 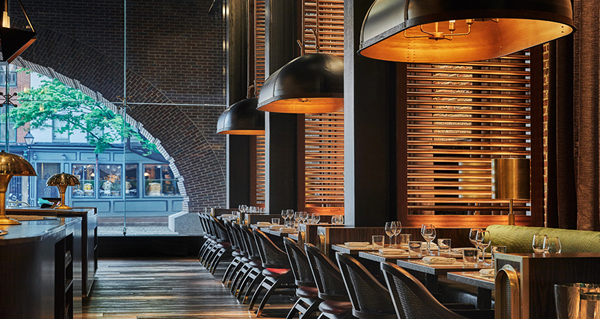 Dramatic etched glass hanging pendants in the prefunction space measure 44” in diameter and were constructed out of eight pieces of curved glass held together by an antique bronze frame. 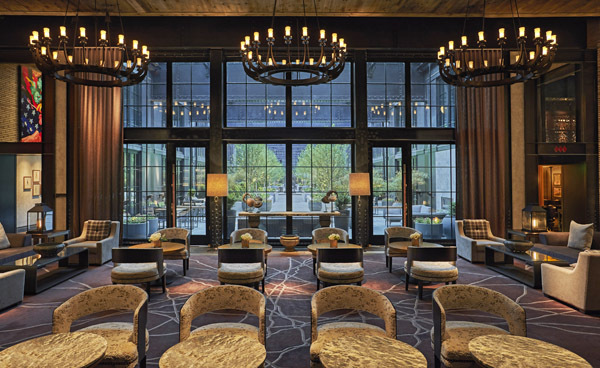 In the Lobby Bar, three 6’ wide, dark bronze and opal matte-glass chandeliers evoke wrought-iron candelabras of yesteryear. 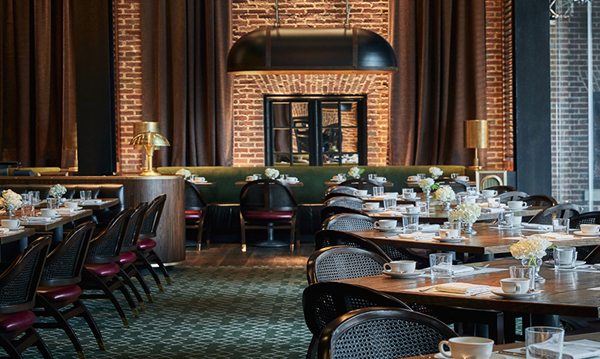 The curved banquettes in the hotel’s signature restaurant, Rec Pier Chop House, were outfitted with six oversized (6’ long) matte black dome lights with 2” leather straps. 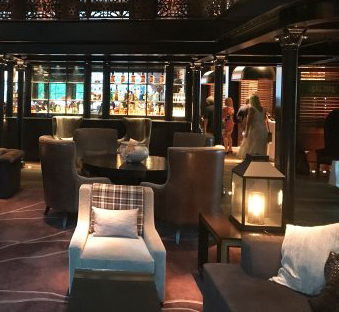 Royal Contract Lighting also produced floor lamps and lantern-style table lamps for the Lounge and more than 120 pendant lights for the hotel’s corridors and restrooms.